Yesterday I read a good friend's blog post about a trip to the Railroad Museum in Sacramento. That brought back the memories. You see, when I was growing up, everywhere we lived (and that is several places) my Dad had a favorite spot to bring people who visited us or just the family if he could hoodwink us into it. In Sacramento that place was the Railroad Museum. I have nothing against the Railroad Museum. It is a fine museum. I probably even enjoyed it the first time. But as a teenager I was not thrilled with numerous repeat visits. Dad would drone on and on about the various locomotives. 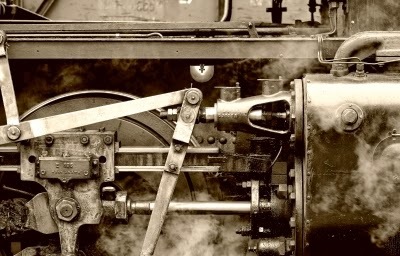 He was endlessly fascinated with machinery and engineering and how things worked. The good thing about the Railroad Museum was that it had a gift shop. This was important because the only way to get Dad out of a place like the Railroad Museum was to tell him that Mom was in the gift shop. That usually got him moving in a hurry. In Louisville, Kentucky his place was the the locks on the river. This was much worse than the Railroad Museum because there was no gift shop. Dad had the car keys and the only way to leave was to wait for him to be ready to leave. This always took forever. When we heard a visit to the locks was in the planning stages, those of us old enough to be left home alone would scatter and hide or suddenly remember vast amounts of homework due very, very soon. Younger siblings would beg to be left in our charge. None of this seemed to dampen Dad's enthusiasm or his belief that if he just explained it all clearly enough we would all find the locks fascinating and enjoy it as much as him. Not long after his death I took a ferry boat ride on the river in Tokyo. As we enjoyed the scenery, I found myself taking lots of photos of locks and river gates. Until I realized I was taking those photos so I could share them with my dad. I wish I could go now to the Louisville locks or the Sacramento Railroad Museum with my Dad and listen to him talk. I'd let him talk as long as he liked. And I'd even listen this time. I didn't realize you'd lived in Sacramento. If you think of any other favorite spots near here you use to visit - pass them along. Our kids feel about "us" as you describe feeling about your dad. Thanks for sharing your perspective. I'm thinking a lot about enjoying the moments....you are so right that they are precious.